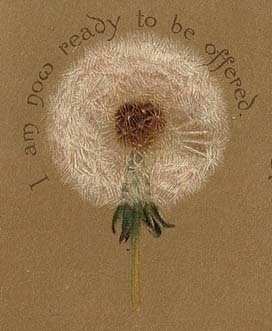 This dandelion has long ago surrendered its golden petals, and has reached its crowning stage of dying - the delicate seed-globe must break up now - it gives and gives till it has nothing left. What a revolution would come over the world - the world of starving bodies at home - the world of starving souls abroad - if something like this were the standard of giving; if God's people ventured on "making themselves poor" as Jesus did, for the sake of the need around; if the "I" - "me" - "mine" were practically delivered up, no longer to be recognized when they clash with those needs. The hour of this new dying is clearly defined to the dandelion globe; it is marked by detachment. There is no sense of wrenching; it stands ready, holding up its little life, not knowing when or where or how the wind that bloweth where it listeth may carry it away. It holds itself no longer for its own keeping, only as something to be given; a breath does the rest, turning the "readiness to will" into the "performance" (2 Cor. 8:11). And to a soul that through "deaths oft" has been brought to this point, even acts that look as if they must involve an effort, become something natural, spontaneous, full of a "heavenly involuntariness," so simply are they the outcome of the indwelling love of Christ. Shall we not ask God to convict us as to where lies the hindrance to this self-emptying? It is not alone mere selfishness, in its ordinary sense, that prevents it; long after this has been cleansed away by the Precious Blood there may remain, unrecognized, the self-life in more subtle forms. It may co-exist with much that looks like sacrifice; there may be much of usefulness and of outward self-denial, and yet below the surface may remain a clinging to our own judgment, a confidence in our own resources, an unconscious taking of our own way, even in God's service. And these things hold down, hold in our souls, and frustrate the Spirit in His working. The latent self-life needs to be brought down into the place of death before His breath can carry us hither and thither as the wind wafts the seeds. Are we ready for this last surrender? Do you ask, "Does God really mean the emptying to reach so far as this?" Study the inner life of Jesus. "I speak not of Myself," He says. "I can of Mine own self do nothing." "I seek not Mine own will, but the will of Him that sent Me." His human self-life, sinless though it was, was laid down that He might live by the Father; and our self-life, defiled and worthless, shall we not lay it down that we may live by Him? Shall we not let Him have His way? Shall we not go all lengths with Him in His plans for us - not, as these "green things upon the earth" in their unconsciousness, but with the glory of free choice? Shall we not translate the story of their little lives into our own? For all their teaching of surrender and sacrifice is no fanciful mysticism; it is a simple reality that can be tested at every turn - nay, that must be so tested. If we are apprehending Christ's death in its delivering power, our homes will not be slow to find it out. O Jesus, the Crucified, I will follow Thee in Thy path. Inspire me for the next step, whether it leads down into the shadow or up into the light. Surely in what place my Lord the King shall be, whether in death or life, even there also will Thy servant be. Amen. Excerpt from "Parables of the Cross" by I. Lilias Trotter. The complete book is available here: Parables of the Cross.